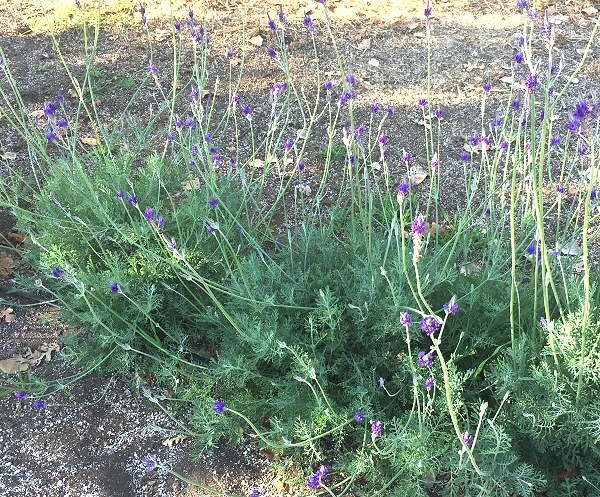 Pinnata Lavender is sometimes called Jagged Lavender or Fern Leaf Lavender because of its unique leaf structure. 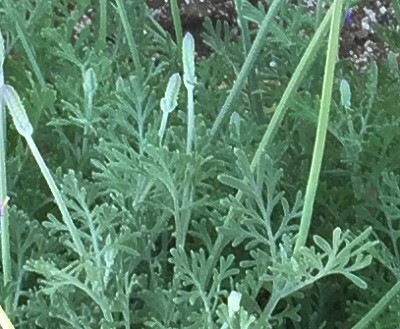 These little flower buds will grow to three feet before they unfurl their whorled flower heads into a spectacular show. Pinnata Lavender cannot survive freezing temperatures. Two nights of 32 degrees or less do it in every time. Fortunately it grows very quickly which makes it one of those unique tender perennials worth growing as an annual. This grouping of three plants was planted from our three inch pots in late June. By late October, they are over a foot tall and the flowers are abundant. It is a welcome fall blooming plant in our zone 8. This part of the lavender field gets a fair bit of shade which in our hot climate doesn't seem to bother Pinnata Lavender at all. The flower stems, which can reach three feet, might be a bit more squirrely because of the shade but are still beautiful. This plant is often available in plug trays. These trays hold 128 of all the same plant. They are a great low cost way to fill a lot of space. Each cell is 3/4 of inch by an inch. Check here to see if Pinnata Lavender Plug Trays are available. in Zones 10-11 Cannot tolerate frost.